Tracker Suite's personnel management software improves organizational communication and eases the workload of HR. Personnel Tracker is a Web based personnel management solution that eases the workload of HR departments by automating processes such as employee vacation tracking, simplifying employee tracking and securing crucial HR data. 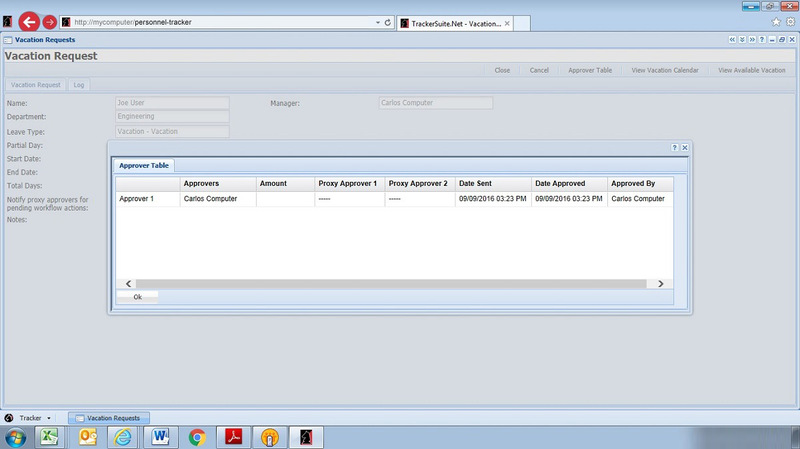 Personnel Tracker can synchronize data with Active Directory, persons added to Active Directory are also added to Personnel Tracker, including important data such as "Reports To", "Phone Number" and "Department". 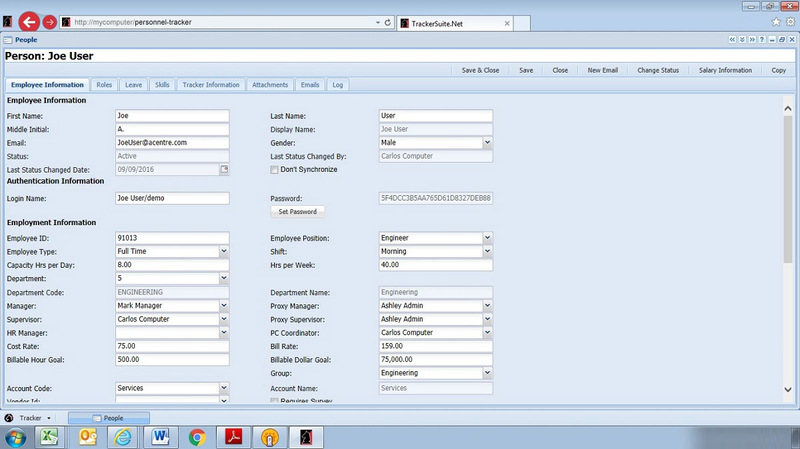 Personnel Tracker is accessible to all employees through the Web or through their email client. 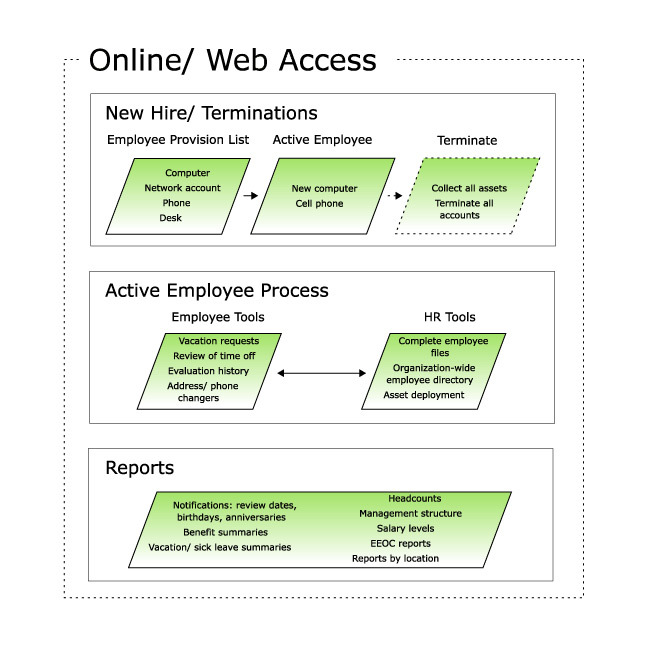 A role-based UI simplifies the user experience and secures access to personnel data. 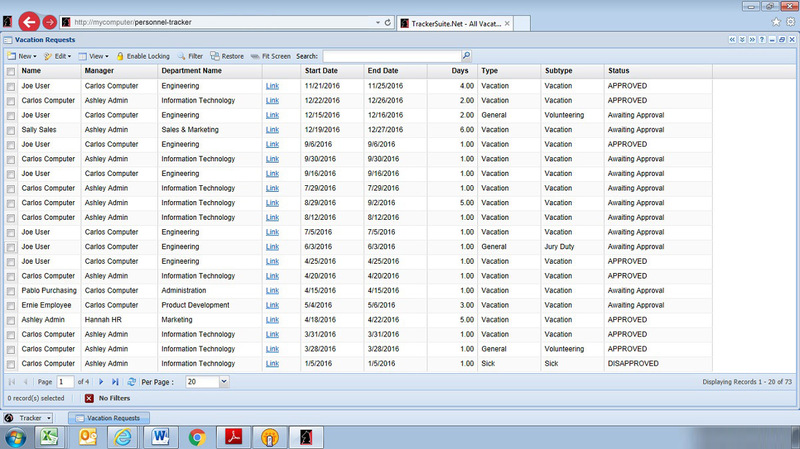 General users can utilize Personnel Tracker as a searchable, organization-wide employee directory to look up phone numbers and office locations, without leaving their email, as well as view color coded company calendars that list vacations by status and company holidays, and submit vacation and change requests. HR managers and administrators have greater access to Personnel Tracker. They can review online employee files and their attachments (resumes, performance reviews, etc. 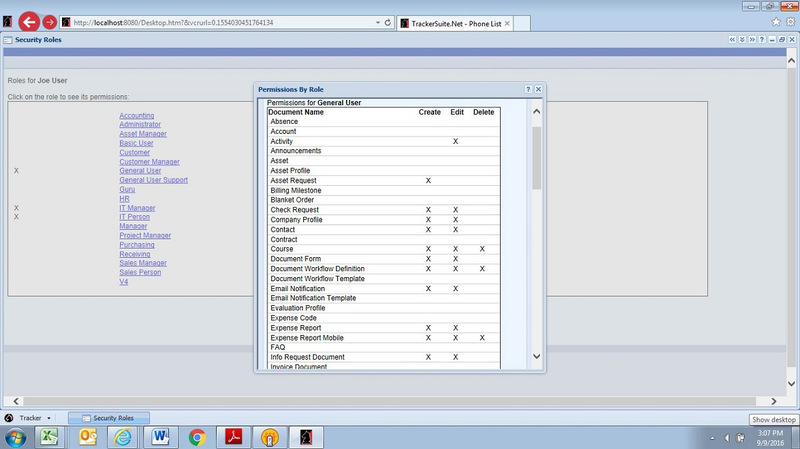 ), search for personnel by skills, view home addresses, manage leave accrual, work status and salary information, as well as manage personnel with utility views that allow them to update multiple employee files simultaneously, such as updates for leave accrual or carryover, employee location, managers, or what options are available to them in the Tracker Suite applications they utilize. The integration of Personnel Tracker with email allows vacation and change requests to be delivered directly to designated approvers within their preferred email client. These designated personnel can review and approve the request within the email, greatly streamlining the approval process. 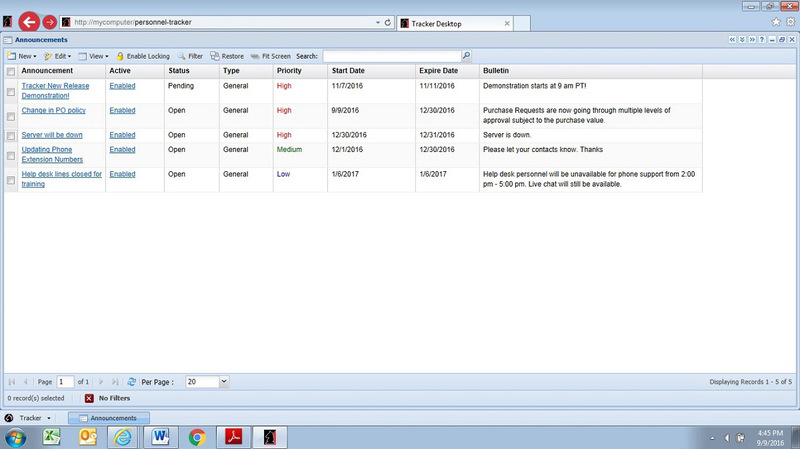 Personnel Tracker also automates the employee roll-on process. A new hire receives a "Welcome" email that includes his or her user name and password. As well as personnel management and tracking tools, Personnel Tracker provides HR business intelligence and reports. It includes functions for org chart generation, and pushes data to the Tracker Data Warehouse, a Web based reporting engine, which generates a wide array of reports including Headcounts, Employee Lists, Allocation vs. Actual and EEOC reports. We have spent a few decades perfecting the art of software design and development. Here are a few examples of Personnel Tracker at work. An organization-wide, searchable employee catalog including pictures, skills, training, and contact information. 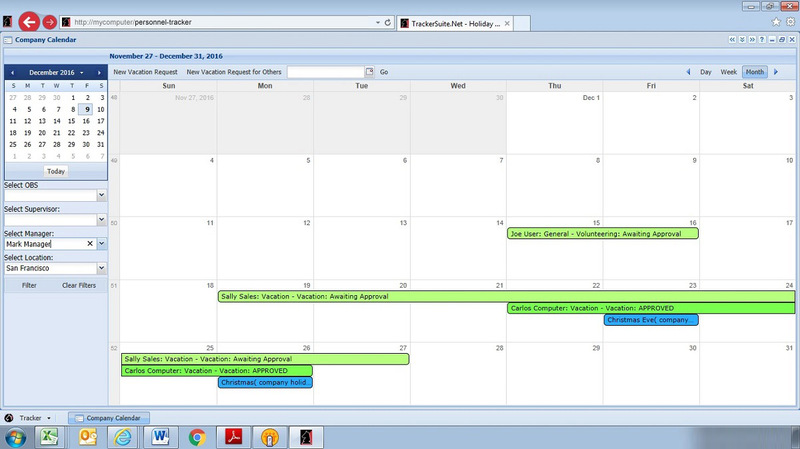 An organizational calendar with at-a-glance, color-coded views of personnel vacation and absence requests by status, as well as company holidays. Centralized security and workflow based on employee type and role. 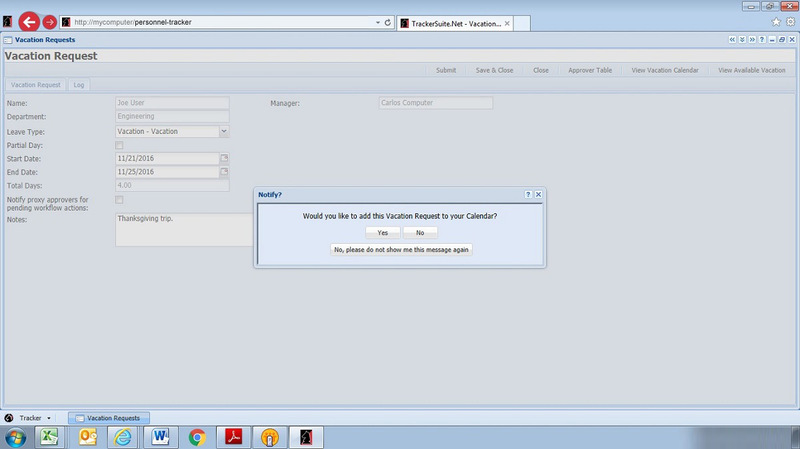 Simplifies new employee introductions to Tracker Suite with a "Welcome" email. Utility views for administrators allow them to review all employee files in the system, as well as update multiple files simultaneously. Vacation availability and request, with email integration that streamlines approval and processing. Integrates with the Tracker Data Warehouse to generate reports including headcounts, employee lists, EEOC reports, salary and management reporting structure. Integrates with Time Tracker, Expense Tracker and Purchase Tracker to streamline and secure processing of timesheets, expense reports and purchase orders. Project Tracker - an online project management system. Time Tracker - a time reporting system that provides Web timesheets. 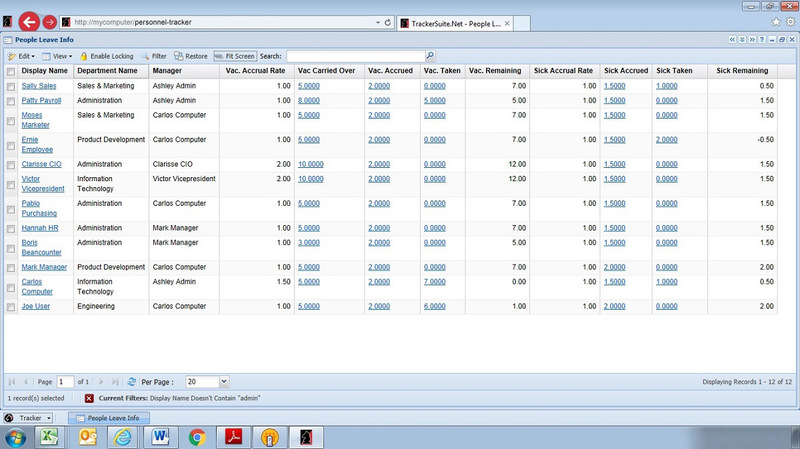 Expense Tracker - a Web based expense reporting system. Purchase Tracker - a Web based purchase order system. Payment Tracker - a Web based check request system. Asset Tracker - a Web based asset management system. Customer Tracker - a Web based CRM system. 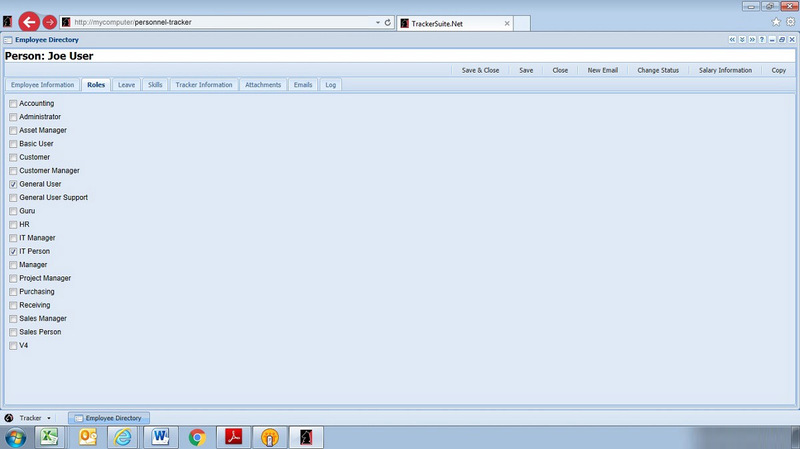 Support Tracker – a Web based help desk application. Tracker Data Warehouse – a complete reporting tool. 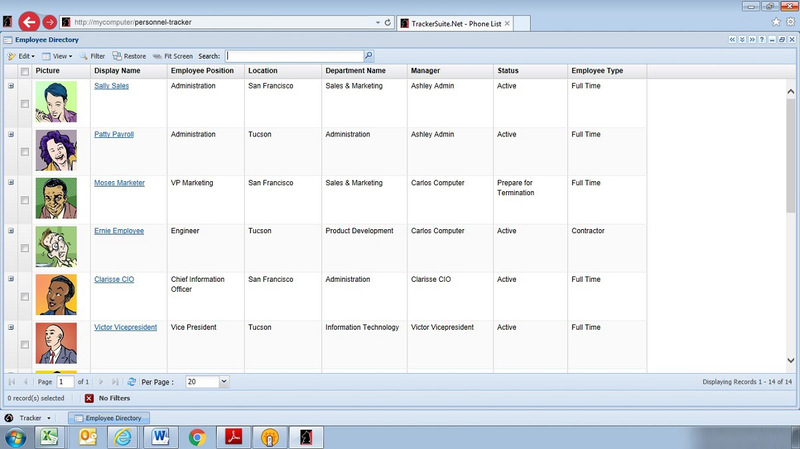 An employee's role in these various applications, and other Tracker Suite modules, is set in their personal profile, which dictates the user interface and tools they may use. Personal profiles also contain the approval routing configurations for timesheets, expense reports and purchase orders, as well as spending limits and timesheet validation profiles.